The end of the world begins as fire rains down from the heavens. Ancient gods are released from their prison, eager to reestablish their long-lost power. But Rachel Deneuve has bigger, more contemporary concerns than a divine war. Desperate to stay away from the carnage—as well as the germ-ridden refugee center—Rachel and Adam flee to their remote mountain cottage, only to find their refuge marred by mutated, grotesque plants and animals. Eventually, the cancerous cells in Adam's body begin evolving as well, threatening his life and forcing Rachel to venture back into the eye of the storm. Left with no other choice but to sacrifice her own freedom for her son's safety, she must become an unwilling warrior in a battle unlike anything seen in millennia, or lose everything she holds dear. 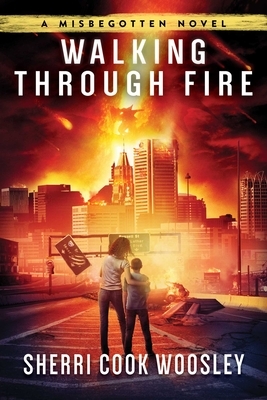 Sherri Cook Woosley, a Baltimore native, is an active member of the Baltimore Science Fiction Circle, having won their amateur writing contest in 2014. Her short stories can be found in Abyss & Apex, Pantheon Magazine, and Flash Fiction Magazine. Walking Through Fire is her debut novel. In addition to writing, she teaches yoga so other people can balance their lives while she juggles four kids, a dog, rabbit, and various other animals. She lives in Maryland with her family.